I’ve been dreading writing this review. I thought about passing on writing a review on it, but after giving it some thought I decided I need to share my thoughts. A Fractured light, sad to say, was a disappointment. It’s one of those books that are on my CANNOT WAIT TO READ list on GoodReads. I am so happy I got the chance to read an advance copy of it, but I just wish I didn’t feel so let down. The story starts a couple of days later from where A Beautiful Dark left off. When I first started reading it, I was so into it. I was basically storming through the first couple of chapters, but at some point the story flat lined. It started to drag and certain events felt so unrealistic that I found myself overanalyzing everything. This book would have taken me a day to read, but instead it took me about two weeks. I would pick it up and read some more, put it down and read another book, then pick it up again. I just didn’t feel like anything was really happening. It wasn’t until the final three chapters or so that I felt the story was finally picking up. Am I going to read the third book in the series? Heck yeah! Because even though I was disappointed, the final three chapters pretty much pulled me back in. It reminded me why I loved the first book so much. What are some positive things I loved? Asher and Skye get a lot closer in this book. Their romance grows a lot more. Although, Skye still feels a pull towards Devin, you pretty much know where her heart stands. Devin makes a huge decision that left me with my mouth open. I just didn’t see that coming and again – just like in book one – he shocked me. Overall, I rate A Fractured Light 2 out of 5 stars. Ohh...This one sounded good but maybe I will move it off the TBR pile since it was disappointing. Thanks for the review! NOOoooooo....the end of book 1 just killed me. I still have such high hopes for this one. It cannot be true!!!!! Eeeeeep I'm so looking forward to reading this one!! I LOVE the first book and that cliffhanger really got me! Another crazy cliffhanger?! GAH! Great review!! Hopefully the third works out better for you. Thanks for the review! I haven't started this yet, but I've been wanting to read A Beautiful Dark. Sorry you were disappointed. I've read a lot of series where the second book pales in comparison to the first (Shiver is the one that comes to mind), but hopefully things get better in the third book! 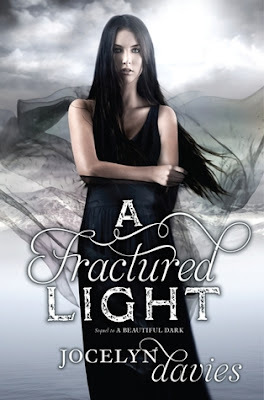 I will say that A Beautiful Dark wasn't the most perfectly written book, but I enjoyed it and thought it had some serious potential for growth in A Fractured Light. Well, shite! Apparently I was wrong. I have to read it anyway, because it is one of my musts. Well, at least now I can go into it knowing not to expect greatness, thanks to you! So, thank you!